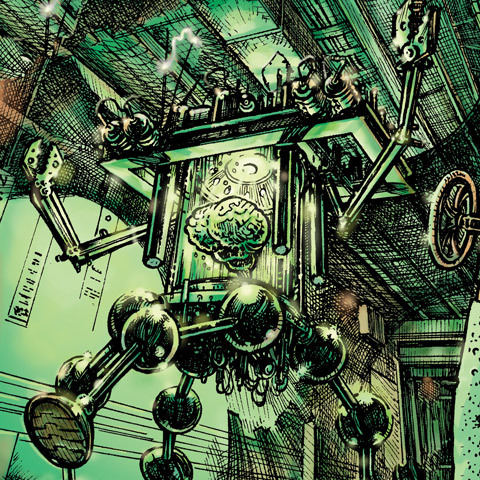 First and foremost, I want to make something clear: this is an idea from John Harper’s Blades in the Dark, the clock mechanic, which I am adapting to 7th Sea. I take zero credit for any of this, and all blame for it’s awkwardness. I absolutely encourage looking to the source material for further insight. Making it a wheel lets me draw it with stubs! Divide that circle into any number of wedges. 4 is the default, but really, 2, 4, 6 or 8 are all fine (or even odd numbers if that suits you). Write down a word or two describe what’s being tracked. Whenever something happens in play to move towards the outcome being tracked, fill in a wedge on the wheel. Sometimes, things will fill in more than one wedge. When the wheel is completely filled in, something happens! Players are guests in the court of Elaine, but are also secretly spying for Montaigne. 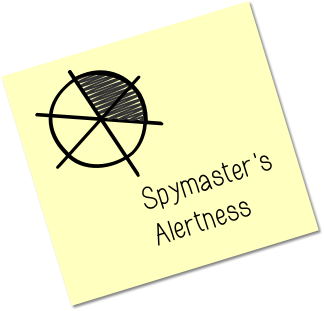 Elaine’s spymaster is on the alert, but not yet suspicious. As a GM, it gives me an extra handle for consequences on a given roll. That is super valuable to me. This scales up and down easily. I can have a wheel in a scene for whether the room catches fire just as easily as I can have a wheel on my campaign for when Posen finishes preparing for war. Wedges can be filled by a raise, by an action, by a scene or by and entire session. It lets me address those situations where my gut feels like allowing something for one raise is too much, but I don’t want to just say no. Because there’s a physical reminder of the wheel on the table, it remains something easy to engage. A quick glance can reveal what’s in play, and serve as its own sort of bookkeeping. Anyway, I offer this as a convenience for anyone looking to solve the same problems I intend to use it for. This entry was posted in Uncategorized on May 26, 2017 by Rob Donoghue. Evil Hat published Blades in the Dark so technically I have an interest in its success. I was, however, entirely uninvolved in its production and approach this purely as a fan. And a fan I am. I backed the kickstarter for the Deluxe Edition (well before Evil Hat became involved) more or less sight unseen purely because John Harper is one of the most exciting RPG designers out there. That Blades also hit all the right notes for me regarding genre and tone was a nice bonus. Not looking to hide either of those things, and if you feel they matter, then absolutely take them into account as you read. 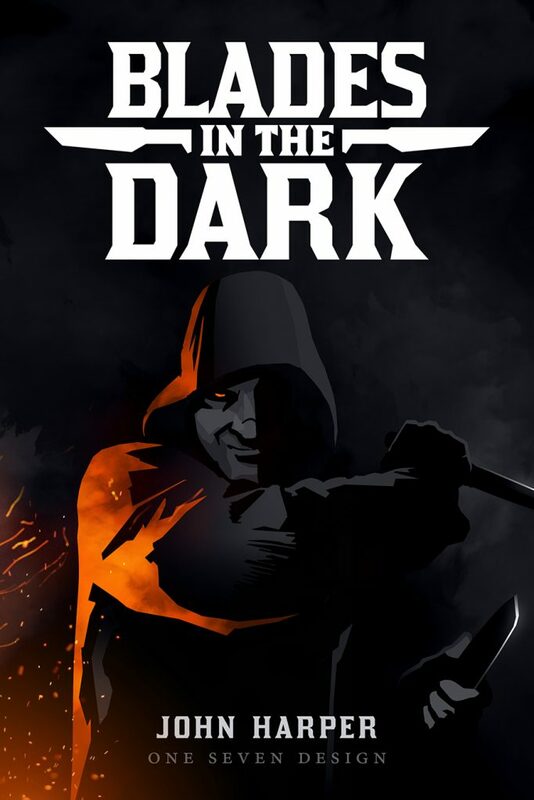 Blades In The Dark is a roleplaying game by John Harper, author of Lady Backbird, Agon, World of Dungeons and a ton of other great stuff. It is a game for playing “…a crew of daring scoundrels seeking their fortunes on the haunted streets of an industrial fantasy city”. 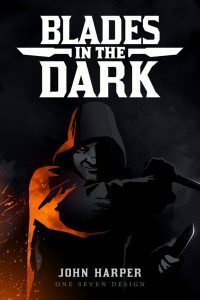 Genre touchpoints include things like The Lies of Locke Lamora and the Dishonored series of video games, as well as a broader net of gritty crime drama and adventure. I’m a great fan of the crime end of things, and I’ve enjoyed the hell out of Dishonored, so this seemed pretty much in the pocket for me. The physical product is noteworthy because it’s darkly lovely. A 6×9 book with a physical profile similar to Evil Hat’s Fate Core, it’s largely matte, in blacks and grays with a little accent. It looks great, but of particular note is the application of gloss. As noted, the cover is matte, excepting the title, and the edge of the blades held by the figure on the cover. It’s a wonderful effect – at the right angle, the blades glint dramatically, and it’s pretty cool. It’s a cool, quirky detail, but it’s in keeping with the rest of the book, where attention to detail is evident in every page. The art is consistent and flavorful, yes, but that’s just the start. See, Harper did the writing, art, layout and cartography, and the result is something where every piece just works to reinforce the whole (this combination of talents is something he has brought to past projects, and one of the reasons I’m such a fan). It also makes it a very functional layout, albeit with some tradeoffs. It is very clear what section you’re in, and information is frequently presented, then presented again in a more digestible format. Everything is organized according to its own internal logic, and once you get that, finding things isn’t too hard, but there’s a learning curve. The flip side is that it’s much easier to absorb on a read-through than to reference, and that was probably the right call for this particular book. Specifically, it is the right call because the text is opinionated and precise. There is a lot of terminology in this, applied consistently an clearly. New terminology is par for course for RPGs, but Blades does not rely on existing traditions, even for seemingly ubiquitous ideas like difficulty or injury. A roll, for example, has position and effect (which is not the outcome) which may account for potency, tier and scale. It all makes sense when you lay it out, but until you internalize what those map to, there’s a lot of time spent reading rules that refer to one or another and stopping for mental alignment (and thanking goodness that the index is well put together). I don’t think it’s onerous, but it’s sufficiently specific that choosing a layout focused on teaching was the right call. Learning the language of Blades seems critical to the process of actually playing it. The first section introduces the game, and is about 50 pages of introduction and explanation of core mechanical concepts. It is a delight. The introduction is an impressively clear and friendly expression if intent that does not come across as marketing copy. The rules themselves are…well, not to put too fine a point on it, the rules are great. I could not go two pages in this chapter without getting excited about how some particular thing was done. So I’m going to really zoom in here, because that’s how I’m wired. Consider yourself warned. The core die mechanic is simple but nuanced – roll some number of D6s, and (usually) check the result of the highest one. 1-3 means things went crappy. 4-5 means success with complications. 6 means a success, and if you got any other 6s, it’s a critical success. Simple is good. I would not feel daunted explaining this to an 8 year old, much less a convention table. As a die pool system, you can aggressively swap out the means by which you determine the pools. Blades uses its skills (sorry, action ratings) to determine how many dice you roll but it could just as easily be Over the Edge descriptors or FAE approaches or nearly anything else that produces a number from ~0-4. It privileges success with complications (an idea familiar to Talislanta and Apocalypse World fans) very interestingly. I need to do up some graphs to truly show this off, but the weight of results is such that you start being likely to get a success very quickly, and you never really leave the likelihood too far behind, no matter how big your pool gets. Support of criticals is a small thing, but important for helping players feel awesome. Making crits a first class citizen of results communicates that the game is a fan of the players. This has the benefits of the generalized Apocalypse World model without the structure that is its hallmark. If one thinks this is a bug, there are plenty of other games to use, but for GMs who have delighted in the framework, but wanted it a bit more generalized, this is delicious. So, yeah, that works. The next section is a brief summary of the structure of play, which is broken into free play, the score and downtime. There’s a nice graphic, but it’s probably a little bit too short an explanation and it’s not really made clear until later on (and at this point I’m still not 100% clear where Free Play really fits, except in the edges). Reading this planted in me a concern that play would be over-structured, so that worry sat in my back pocket as I continued. It then shifts back to mechanics, talking about how dice pools are built. Practically, it’s simple – pick a it’s-not-a-skill-it’s-an-action-rating2 like Command or Prowl and roll a number of dice equal to the dots you have. And yes, dots. Technically, it’s a numeric rating from 0-4, but White Wolf taught us all that dots are just more fun, so I’m all for it. Plus, the use of dots allows for a really clever hack for attributes that is mostly visual. Bear with me for a second: there are 15 12 action ratings and 3 attributes (insight, prowess and resolve) and each attribute has 4 action ratings under it. However, the attributes don’t have independent values – instead their value is derived from the number of action ratings you have a score in. Which means that if I stack those 5 action ratings, then my attribute is equal to the dots filled in in the first column of dots. Next section is on stress and trauma. Stress is really interesting because it’s definitely not hit points, but also, it’s kind of hit points. When something bad happens to the character, the player can say “No” and spend some stress. I make the comparison to hit points because in a simpler game (that is, once where consequences were all injury) that’s more or less what they would be. An ablative layer of points which you burn through rather than take consequences. But I do not say that as a criticism, rather as profound praise. Turning hit points into spendable currency is a fantastic twist, and paired with abstracting them out as general purpose consequence avoidance (rather than just faux-injury tracking) is an incredibly powerful one-two punch. This is an amazing idea. Trauma is what kicks in when you burn through all your stress – you pick up a trauma (there’s a list of options) and it’s a permanent part of your character now. Pick up four traumas and it’s time to retire the character. This is interesting, but it gets a little more curious when we get around to discussing injury, later on. The next section is on progress clocks. Structurally, they’re similar to Apocalypse World‘s Shot Clocks, but as with other AW rules in Blades, they’re made a bit more multi-purpose. 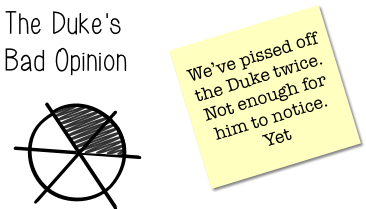 In short, any time something that comes up that you might want to track progress against (the alert level of the duke’s mansion, your attempt to rebuild your dead spouse, how pissed off a rival gang is, etc. ), you draw a circle and divide it into wedges. How you check them off depends on the situation, but generally when they fill in something happens. There’s some explanation of tricks you can do with different clock types, but it’s just a progress tracker, right? See, this is one of those ideas that is really easy to get, but whose expression has always been a mess. We tried something similar in Fate 2e, and I loved it, found it clever and useful, and discovered that it was stupidly complicated to actually explain to people. Harper has taken this idea and refined the language and presentation to the point where it is obvious, so obvious that it does not seem like it is even worth noting. And that right there, that is some goddamned craftstmanship. So, yeah, this is good tech. And it fits tidily on an index card, so that absolutely suits my GMing sensibilities. Player states what they’re trying to do, and which action rating they’re using to do it. There can be some discussion and negotiation around this, but it’s generally skill picking as we know it. The GM also chooses the effect level of the roll, which is sort of a dial for how effective the course of action being taken is. Default to standard, but might be great (if you’re using the right tool for the job) or limited (if you are using the right tool for the wrong job). Narratively this might mean a number of things, but mechanically it translated to how many ticks a success will generate. A dance is done to see if the player has bonus dice. We’ll deal with that separately. Now, there are 3 separate results tables (based on position) and while they all largely conform to “1-3 is failure, 6 is success, 4-5 is mixed success”, they differ in the details. Specifically, the consequences of failure or mixes success are lighter for a controlled roll than they are for a risky roll, which are lighter than they are for a desperate roll. I like two things about this. First, it adds an element of nuance to the signaling behind a die roll. Going to the dice is a signifier to the player that things are going down, and PBTA games are really good are supporting that communication, but they do so in a very blunt fashion. Allowing a little more sophistication tunes the message. “We’re going to the dice, but things have not escalated yet” (or the inverse) for example can be a useful message. These tools gives a better handle for things like rising and falling tension. Second: There’s an built-in escalation model that I really like. Among the possible consequences for a 1-3 result is “Try again from a worse position”. That is, if you fail a roll under controlled circumstance, you falter, and if you want to press on, it will be risky. If that risky roll fails, you’ll pay a price, but may still make a desperate attempt. This is a small thing, but it means that it transforms failure from an end state to a transition(possibly with consequences) and, specifically it does it in alignment with how I’ve seen players actually act at the table. How do I mean? In my experience, when players are invested in a situation an encounter a failure, the usual (and best) response is “Ok, what else?”. Supporting this warms my heart (and, in fact, one subtle advantage of controlled rolls is that re-trying is easier). Now, note here that this is a player roll. The GM does not roll for NPCs, so NPC opposition is implicit in the roll, and figures heavily in the implicit consequences of a failure or mixed result. Not a huge detail, but worth noting. So, once you have rolled, it generates an effect. Remember that the GM set the effect level before the roll, and while mechanically that may mean it’s “Great”, “Standard” or “Limited” what it hopefully means in practice is that the GM has set expectations for what success looks like. This may seem like a small thing, but it can be a critical point of disconnect, and it’s very reasonable to make it explicit. It also is going to be a hard rule to follow. I fully cop to often deciding on the effectiveness of a roll after the roll has been made, and that is not going to fly here. Treating a 4-5 as less of a success than a 6 is an easy trap to fall into (especially if you’re still thinking in PBTA terms) but it’s explicitly at odds with the intent of the rules as presented. I should add, I am willing to improve my own behavior because I like this a lot. Success + Consequence is a different genre of play than Partial Success, and specifically, partial success has a bad habit of forcing players to walk back from their expectations of the fiction in favor of sometimes arbitrary compromises. Not every player will prefer cost over compromise, and that’s fine, but I know my tastes go that way. Anyway, I will say the language around effect is a little awkward. It standardizes the usual factors that might impact effect as potency, quality/tier(tier being like quality for an organization) and scale. Making those keywords and applying them in a simple fashion seems very practical, and there’s actually a heartwarming table of these factors towards the backfire anyone who wants to really dive into them. However, they’re not really called keywords, so I’m not 100% sure how to talk about them as a category. Small thing. Lastly, we get some mention of consequences (injury, etc) but that’s in another section. More critically, now that we’ve gotten to the end, I want to step back to a really interesting subsystem here, which is how to get extra dice. There are, modulo special abilities and whatnot, three ways to do it. First, if an ally wants to help, they take one stress, describe how they help3, and you get a +1d. Second, if you just want to burn resources, you can spend 2 stress to push yourself and gain a die. Third, and most interesting, you can accept a Devil’s Bargain. You can’t do this and also push yourself, so there are some limits, but the mechanic is simple: Someone (GM or player) proposes some way in which things might get worse. It might be mechanical (spend a resource, get hurt, tick up a clock) or it might be part of the fiction (Collateral damage, anger an NPC) but whatever it is, it has an edge to it. The player is not obliged to accept the bargain, but if they do, it becomes true (however the roll goes) and they get an extra die on the roll. I kind of love the devil’s bargain mechanic. It serves a very similar role to Fate’s compels, but in a rather more free form fashion, and that is right up my alley. And with the opportunity for player input and the decision in the acting player’s hands, this is is a well constructed rule for maximum fun opportunities and minimal headaches. But there’s also an interesting nuance to this. Something I haven’t mentioned is that if you have zero dice to roll, then you roll 2 dice and use the lower one. Painful, but easily mitigated because even a small pool is powerful. Later on, the text notes that 2 dice (not-coincidentally the number you can get from help plus pushing yourself or taking a bargain) has a 75% chance of getting at least a complicated success. This is presented as a supporter of character competence, and that’s true as far as it goes, but I think it has a more subtle knock on effect – it reduces the social friction of having and using skills at zero, which creates more situations where Devil’s Bargains become appealing. It is, frankly, a little bit sinister, and I applaud it soundly. Ok, let’s hop back out of the sidebar and into the land of consequences and harm. Ok, so you blow a roll or something goes wrong, and you take a consequence (maybe more than one). Straightforward enough. Broadly, those consequences might be reflects as reduced effect, complication, lost opportunity, worse position or harm (these are actual in game categories). This seems simple and intuitive, and it can be, but there’s actually a fully engineered solution that lies underneath them which merits unpacking. I actually had an interesting time really digging into this section because at first blush it seemed obvious, then puzzling, then obvious, then contradictory, then maybe clear. I’ll spare you the steps of my puzzlement, and lay things bare. The consequences rules have an unclear relationship to success and failure. This is because some consequences either expressly imply failure (lost opportunity, worse position) or allow the negation of success through the situation (reduced effect, complication4). This would make sense if the implied failures all came up on 1-3 and the potential negation were 4-5 (though that introduces a different problem), but it’s not quite that clean. Lost Opportunity only ever comes up on a 1-3, so no problems there. Complication can always come up, so that’s fine too. Worse Position is more muddled, since that happens in 1-3 and 4-5. The Consequences rules talk worse position in terms of failure, but if I read the tea leaves on the outcome chart, I think that’s not the intent. It seems like 1-3 is “You failed, things are getting worse, you can try again from worse footing” and 4-5 is maybe “You succeed but are now in a worse situation”. But I’m genuinely not sure. Reduced Effect makes me most nervous. I get the intent, but if I’m trying to play it strictly as written, it can retroactively undercut the idea that a 4-5 is a “real” success, and that would in turn undercut a lot of the foundation of character competency. I get why it’s there: there are plenty of times that reduced effect is the right result, and can be done without negation, but that takes a deft hand, or at least a little experience. Thankfully, it’s not hard experience to come by, but this is such a broad outcome, I wish it had gotten unpacked a little more. Harm is always an option, but that is it’s own kettle of fish. It comes in 4 flavors, lesser, moderate, severe and fatal. The character has 5 text fields (2 lesser, 2 moderate, 1 severe) and as they’re hurt, they write down the injury in the appropriate slot for the harm. If no slots are available, it rolls up to the next category (and if you roll up from severe, then it’s death or permanent injury time). Characters suffer penalties based on the description of their injury and the level of the harm. Notably, while I’m speaking exclusively in terms of injury, this is actually a fairly broad system, and harm could just as easily be fatigue or emotional trauma. It’s solid and utilitarian. Where it gets interesting is in how you avoid it. When the GM drops a consequence on your character, you can choose to resist it. You roll the appropriate attribute for the situation, then spend 6 stress, minus the highest die result. Importantly, this usually does not negate the consequence, but it reduces it in severity (so a fatal consequence might become severe). However, in some situations it might just negate it entirely. There’s a note at this point which calls out that this is a very important point for genre and tone – the more things that resistance rolls can avoid entirely, the less gritty the game shall be. Armor, because there is always armor, has checkboxes (one or two) and you can mark them to automatically resist without spending stress. In a weird twist, though you can only roll against a given consequence once, if you’re wearing heavy armor, you can mark it twice to do a double-reduction. All of which leads us to death. Get hurt too bad and die, and you can either create a new character or pick up the Ghost playbook and continue. I admit, I can’t wait to see how that works. From this point on, we’re largely dealing with outliers and one-offs, so apologies if this seems disjointed. Fortune Roll – The fortune roll is a mechanic I welcome – it’s a mechanization of the time honored GM tactic of “I have no vested interest in how this goes, let’s see what the dice say”. It’s useful for resolving matters offscreen, handling weird situations and as an all purpose resolution to edge cases. If this rule didn’t exist, I’d be using some version of it anyway, so I’m all for it. Information management – It’s not actually called that – the section is technically “Gathering Information”, and it’s a description of how skills can be used for data gathering (and most skills can be used that way, Feng Shui style). It’s also important as it explicitly expresses the philosophy of information – in this case that it largely falls under the auspices of the dice. That may not seem strange, but if you’re coming to Blades from a wide background of games, it’s good to make sure that’s clear rather than leave people wondering if they’re supposed to Gumshoe it up. Example of Play – This is weirdly placed. We’re not really done the basics yet, nor are we at any clear transition. It’s a good example, but I honestly had to come back to it later after I’d internalized more of the book and terminology. PVP – Not a lot of mechanical differentiation for PVP, but a lot of social consideration. Big emphasis on clear communication and keeping the in character conflict from spilling out of character, and I kind of applaud that, even if the actual resolution is a bit ad hoc. Money Abstracted wealth, represented as coin, with one coin being about a week’s wages. There are some rules about how much coin you can practically keep lying around, and they seem a little arbitrary, but their purpose is to (effectively) drive players to put money in their “Stash”, the rating that determines lifestyle quality and your fate upon retirement. However, coin also gets spent on a lot of other stuff, so I’m curious how this actually plays out. Going to break out of bullets for The Faction Game – this section is a little weird, and only really gels as you see some of the later rules and examples. Still, the basic idea is simple enough: A faction is a group (usually a gang) and it has stats including Tier (general size & quality), Hold (whether it’s position si strong or weak), Rep (Effectively XP/currency for development) and Turf (territory you own). It also may have Status (from -3 to +3) with other factions, indicating their relationship. Factions also have claims, which are bits of “territory” they control (and are sometimes turf, but also sometimes not). This is a little wacky because there’s a map of potential claims that is reminiscent of the advancement tree from a JRPG. A group starts with a Lair and can try to seize an adjacent claim, then once that is seized, the number of adjacent claim’s has increased. At first blush, it was confusing to read. The example map both clarifies the idea but also leaves me a little confused on how it’s supposed to apply on my table. Thankfully, a lot of this stuff gets unpacked later on, but I had to bookmark section as something to come back to later. FInally, we end with Advancement. Short form – gain XP in play, during downtime by training, or at the end of session by checklign a checklist of things like your drives, issues etc.. XP is marked on tracks…of some kind, which gets advances…at some point. As might be made clear by my confusion, this is one of those areas where there rules are not actually in the book but require that you have the PDF of playbooks on hand. I admit – I kind of hate that. Interestingly, there is also group XP – the crew has its own XP track and advances similarly. Ok, you can stop and maybe get a beverage. We’ve gotten through the basic rules, and that’s going to be the densest part of this. Not that the rest isn’t interesting, but this section is where I really nerded out. From here on out, it should be clear sailing. The chapter starts with a note about how skills at 0 is not that big a deal due to the ease in building a pool. It’s a good reminder. From there, we get into actual chargen – it’s a playbook system , and the 7 playbooks are Cutter (melee violence), Hound (range & tracking), Leech (achemist/gadgeteer), Lurk (sneaky), Slide(face/grifter), Spider (mastermind) and Whisper(magic and weirdness). The language is delightfully flavorful – these are all terms that can work well in conversation – and support the idea that all characters are scoundrels. There is some explanation about how these are playbooks, and they’re totally not classes, and I’m a little skeptical of that since it’s predicated on some very specific definitions, but that’s all well and good. Once you pick your playbook, you then pick a heritage (non-generic nationality, because these are all setting explicit) and background (what you did before). These are potential hooks for generating XP, and they’re supposed to influence your point spend, but they don’t carry much mechanical weight beyond that..
Next up, assign some points (4 points, in addition to the 3 that are pre-bought by your playbook), and pick your first ability from your playbook. In a nice touch, the first ability on each playbook is solid default choice for the uncertain. After that, choose one close friend and one rival (from the list on your playbook), your vice and vice purveyor, then fill in details like name, alias and look (all framed in a fairly PBTA fashion, but pleasantly decoupled from the actual playbooks). One nice touch about pulling from a fixed set of NPCs is that the names will see re-use from story to story. Marlene, the pugilist is going to show up in many games, and it will be very interesting to see what similarities and differences emerge from game to game and which NPCs groups start to feel are iconic in what ways. Similar benefits come from naming the vice purveyors. The rules for equipment (“Loadout”) are kind of slipped in after the chargen summary, and they’re worth noting because starting gear (listed in your playbook) is not what you have, but rather what you have access to. The number of items that you carry around translates into a loose encumbrance system, but the critical piece here is that it is expected that characters will be swapping out their loads from situation to situation. I like the looseness of this, but I especially like that it keeps equipment important while still removing the shopping trip from chargen. After this we get a deeper breakdown of the different actions (aka not-skills) before diving into the individual playbooks. There is an option for ghost punching. I do not understand why it is not the default. Because ghost punching. Lot of good abilities for leading a group in combat. There’s stuff for personal badass, yes, but it’s an interesting emphasis. You have the option of carrying a heavier weapon, which is interesting in that it has no explicit mechanical impact so much as it grants implicit permission to have an advantage in the right circumstance. Seems fuzzy, and I’m not sure if that’s incredibly potent, or less than useful. XP when you address a challenge with tracking or violence, which seems like it should pay off decently. This is a curious archetype because if I were to describe this in a non-gamer fashion, it would absolutely have a stealth component (since this is implicitly the sniper) but because that’s the domain of the Lurk, it seems to tiptoe around that a little. The Scout ability has some of it, but I suspect there’s a reason it’s not the default. Get XP when you address a challenge with technical skills or mayhem. I take back what I said about cutters – this has got to be a bottomless font of XP for a certain type of player. I’m actually a little curious how this one works because a lot of different ideas are under one roof here since it’s medicine, alchemy, gadgets and demolitions all in one. Unsurprisingly, lots of crafting abilities. Haven’t gotten to those rules yet, so hard to judge. Physicker (the I’m a Doctor, dammit) ability also squeezes in some first aid rules in the fine print. You get a bandolier of flasks that you can throw to do stuff, so that’s fun. So a comment on twitter indicated to me that no one picks this playbook, so I’m now doubly curious. Gain XP when you address a challenge with stealth or evasion – well, that might be part of it. Those are both situational enough that I don’t see them as quite the fountain of XP as some others. I think part of the rub may also be that the default ability, Infiltrator, lets you ignore quality or tier when bypassing security measures. That ability makes total sense in a mechanical sort of way, but it feels kind of boring. The effect is in the GM’s hands, so it’s a bit of a black box, and there’s a lot less player-contact than even something as simple as a +1d. Worse, it also depends on the GM providing a specific sort of opposition, in which case the reward is that it’s no worse than normal. Similarly the Reflexes ability (whenever there’s a question, you act first) is something that sounds cool, but I genuinely don’t know how often it comes up. Also, it probably doesn’t help that the Hound gets the sniper stuff. But you do get to turn into a living shadow at a cost of substantial stress, so that’s cool. Ok, I tend towards the grifter or mastermind, so I’m definitely eyeing this one with an eye towards whether I’d play it. Gain XP when you address a challenge with deception or influence – Hrm. Ok, less bountiful than violence and mayhem, but still doable. Ok, some of these are awesome. Tell when someone is lying to you? Cloud minds like the shadow? Bonus money? Resist consequences from suspicion & persuasion? Yeah, I’d have a hard time choosing. Plus your equipment includes a disguise kit, loaded gambling gear and a swanky outfit. Yeah, this playbook is made of awesome. Gain XP when you address a challenge with calculation or conspiracy – ok, that should payoff well. Default ability is to assist without paying stress twice per session. That is concrete and valuable in a way that’s hard to pass up. Damn, these abilities are awesome, with especial Nathan Ford props for “Functioning Vice” As with the Slide, these would be hard to choose between. Most curious about this one because it implicitly tells us a lot about what magic means in the setting. Earn XP when you address a challenge with knowledge or arcane power – hard to judge this one until we know more about what arcane power looks like. So, the first ability allows you to compel a ghost, but it does depend on there being a ghost to compel and you might need to roll to find one. Feels a bit thin. Having read to the end of this, I feel no closer to being able to judge it than when I started. Some of this is because details depend on other sections of the book, some of it is because a lot of stuff seems to rely on things outside the player’s sphere. But I may also be reading it entirely wrong, and later sections will make it clear. Dunno. We wrap up with general equipment (available to everyone) and a very nice point that the Devil’s Bargain mechanic is a great way to handle a lot of the fiddly belts about gear. Ok, this is some hot stuff. Building a common resource is always fun, and making your group’s crew looks super promising in that regard. Delightfully, the crews also follow a playbook model (with the playbooks being Assassins, Bravos, Cult5, Hawkers, Shadows & Smugglers). To make a crew, the group picks a playbook and sets initial stats for the crew (tier 0, strong hold, 0 rep, 2 coin) and pick a reputation and a lair. Reputation is an XP engine, and the lair is pretty freeform, with the expectation that the players will tie it to the city map. The group also establishes the crew’s “Hunting grounds”, the are they operate in, and establish a little bit of history regarding how they got it and who they got it from. The crew gets bonuses for operating within their hunting ground, and it can expand in time. Somewhat confusingly, the hunting ground is not a claim, though it is related to turf. You then go to the playbook and pick a special ability and two crew upgrades. One kind of fun tweak to upgrades – every time you take an upgrade, you pick a faction that helped you and one that got screwed, and update your status with both. It’s a lovely little rule that keeps things dynamic. Lastly, pick a favorite contact for the crew. As with the named NPCs on the character playbooks, this is going to make for fun continuity. Worked in here are rules for cohorts, which is to say followers, notably gangs and experts. Not every crew starts with cohorts, but they’re an option. Cohorts have a type (an area of expertise) and a quality rank based on the crew’s tier. In addition, gangs have scale and Experts have edges and flaws. There are rules for using cohorts, rolling dice, harming and killing them, and it all seems pretty straightforward. The specific choices of each playbook are in the book themselves, including the map that the group uses for claims. I admit, that’s both cool and weird – cool because it’s stylistic, weird because I would have expected the map to be based on the setting, but so long as I view it as an XP system, it works. Notably, each playbook also includes a list of job seeds as opportunities. Earn XP with successful accidents, disappearances, murder or ransoms. Earn XP for advancing the agenda of your deity or embody its precepts. I suspect that requires some serious unpacking at the table. Upgrades are dull, but abilities include things like secret communication and making Worship a vice. Curiously, I suspect this requires almost as much setup as a cult, since you are effectively declaring a subset of the economy. Some interesting abilities, including an ability to turn good relationships into turf, or buy and sell with ghosts. This is definitely an option that gets more interesting the closer you look at it. This is probably the closest thing to a “default” choice, since it’s, well, thieves. Gain XP when you execute a burglary, espionage, robbery or sabotage attempt. Yeah. Default. I can’t really point to any one ability as signature, but they’re all really solid. This is definitely a good default. Earn XP when you execute a smuggling operation or acquire new clients or contraband sources. BTW, may I note how much I appreciate that the crew XP hooks are also adventure creation prompts? Some of these abilities (I’m looking at you, Ghost Passage) are vibrant enough to be group-defining. Curious, every other Crew’s default ability is the “+1 to 3 action ratings” one, but for smugglers, it defaults to making your vehicle more interesting. I totally dig that conceptually (Firefly, Star Wars, all that jazz) but I am less than sure what sort of vehicles make sense in this context. Hopefully, setting info will make it clearer (Note from later: Nope). This is where the rubber meets the road. It’s the Job. Maybe to steal something valuable. Maybe to smuggle an aristocrat out of the city. Maybe it’s seizing new territory. Whatever the case, there’s a plan, engagement and flashbacks. Tellingly, the rules actually consider planning and engagement to me one step because this is a no-plan system. Once you’ve picked a target (which happens before this process starts) you pick the type of plan (Assault, deception, transport etc.) and answer one broad question about it, providing the missing detail (like, “what is the point of infiltration?”). Players pick their loadout, then go. Yes, there is a distinct lack of planning in that planning. This is intentional. Play start with an engagement roll, which is really a framing device to answer the question “as we join our heroes at the start of their caper, how are things going?”. It’s a straightforward mechanic and it’s designed to go to action as quickly as possible. From there, the action is supported by a profoundly robust flashback mechanic. It is expected that everything that would normally be handled by planning is instead handled in flashback. If there’s some question as to how likely the flashback is, the GM can opt to charge some stress for it, but by and large the players can backfill like mad. This is pretty cool. Upgrading flashbacks from a cool option to the default behavior is pretty bold, but I think it works. And as a player who actually likes the planning part of planning, I’m willing to sacrifice it if this works as smoothly as it looks. All in all, the setup is pretty lightweight, and it means with only a few elements, you can very quickly get the crew working a score. That’s an excellent thing. This chapter also includes the teamwork rules, which are pleasantly elegant. Some of it is simple (Assisting means spending stress to give someone a +1, Protecting someone lets you take a consequence instead of someone, Set Up lets you give someone improved effect or position by setting them up for success) but the real magic is in group actions. When the group does something, pick a leader, then everyone rolls. Overall result is based on the best roll (whoever made it) but for everyone who rolled a 1-3, the leader takes one stress. This was a necessary rule to articulate if for no other reason than to express how to handle group stealth – a perpetual headache in criminal games. While this is a little meta (I’m not sure how I’d handle it if the stress ended up bonking a leader) I am willing to accept that for ease of handling. Chapter ends with a very thorough example of a score, including varying interpretations based on how the dice fell. Thumbs up. Ok, so we’ve outlined the Score as the central action of the game, and with that in mind, downtime is a way to abstract out what characters do between Scores. I mean, yes, they might do some roleplaying too, when the opportunity arises, but this covers broad stroke actions. I was a little worried about this chapter. From a high level, it seemed like it would be very easy for this to be the “boardgame” element of play, between scores, and that model is more restrictive than I care for. And it’s not that the game can’t support other modes of play – it clearly can – but the question on my mind is whether those other modes are supported, rewarded or penalized. I’m not sure I have a satisfactory answer yet, but let’s dig in a bit. There are 4 parts to downtime. The payoff depends upon the score that just finished, and there’s a formula for how much rep and how many coins the crew gets based on the target, the job and other factors. Some of it might also need to go to paying off other criminals and such. At first glance, the payoffs seem small, but I’m willing to trust that they’re not. Second, you see how much heat (unwelcome attention) the job generated. Again, this is formula driven, and crew has a heat track that works like the character’s stress track, and if it gets to high, it adds “Wanted Levels” which only get cleared by somebody going to jail. There are rules for going to jail which kind of make it its own mini game, and jailtime can explicitly be an excuse to try swapping in another character. Third, entanglements is a system to abstract the shifting complications that have unfolded around the job. These are play prompts/plot hooks generated by a random roll based on the crew’s heat level. Functionally, this is an “And then something happened” roll, but I admit it does not feel quite as elegant as the other downtime steps. I think I need to see it in action a few times to get what it’s supposed to feel like. Lastly, the crew members can engage in Downtime Activities like making things, pursuing long term projects, training, indulging vices (the only way to regain stress) and so on. There are rules for all these mini activities, and each character gets to do two per downtime. It’s a mini game, plain and simple. There are also rules for modeling downtime for NPCs and other factions, and they are thankfully streamlined. It is probably not the best decision to go from the most abstract and mechanized section of the rules (downtime) to an explanation that Blades is not a mechanics first game. That disconnect aside, we start with a solid explanation of Fiction-First gaming which I will not fault, but I also will not dwell upon. The next section on what triggers a roll is much more practical, and I very much like that the third possible criteria is” when someone gets excited and grabs the dice”. It’s a good breakdown and it gets into some of the meta-thinking behind the scenes about risk and stress, and just as the game is opinionated, so is this section. Specifically, there’s a very interesting assertion that the purpose of threatening harm is not to inflict it, but to describe it, with some natural conclusions from that which feed into the resistance mechanic. I admit, I usually just blah blah blah over this stuff, having been burned out on it long ago, but it’s really worth reading this section if only because it answers a lot of questions about why some of the things in this book are what they are. We move past the general advice when we get to a breakdown of actions, with each action getting a gm-slanted perspective on how that action is used in the game, along with examples. If any of the actions seem unclear, this is a great tool for unpacking them. Now, they’re best practices, not ironclad rules, so maybe there’s a quibble or two to be had, but it hardly matters. What does matter is that this is a clear explanation of the game as imagines, and it speaks to the player in the same way it does a GM, and that’s awesome. After that is a one page….editorial, I guess?…about how the game played for someone. It’s fun and all, speaking to the play cycle of score to play to downtime etc, but it seems a little random. I did a double take here and checked the previous chapter because the first half of that had seemed aimed at GMs already, so what’s in this chapter? It’s a darn good list. Then we get another editorial about improvising gothic storytelling with Electroplasm. Again, not bad, but weird. Next section is on starting the game, and all the things to do in preparation and setting expectations. There are good guidelines here, and there’s a sample starting situation, which is a useful resource. I like the idea of this section a lot, and the inclusion of useful questions is welcome, but it feels like it’s a little light. Hard to pin down precisely why, but there are lots of other procedural parts of the game which have been refined down to near-checklists in their clarity, and this feels like it did not get quite the same treatment. It is a very mild complaint, though, since simply having a section like this is quite excellent. We end with some guidelines about ending games, resolutions, seasonal models an rotating casts. Solid enough. Woo, rules for magical stuff! Comes in 4 flavors: Spectrology (ghost stuff), Rituals (Ancient demon stuff), Alchemy (Alchemy stuff) and Spark-Craft (Lightning/steampunk stuff). We get a little bit of an explanation of the ghost field and what it means to the world (short answer: there are lots of ghosts in it). We get some cool color about Spirit Wardens and body disposal, and a list of terminology to help distinguish a Hollow from a Hull, followed by longer explanations of key ideas like devils, vampires, demons and so on. Perhaps more critically, this is where we also start talking about playing spirit characters. There are playbooks for ghosts, Hulls (ghost-possessed crafted frames) and Vampires (result of full possession). They have wacky powers, but also have more pronounced limitations and needs. I’m kind of torn on this. These are all really awesome in their own right, and I can see how they reinforce a certain kind of flavor, but they also seem like an entirely different game than the rest of the book. It’s not a huge deal – this is maybe 10 pages of material in a 300+ page book, so I’m not complaining about wasted page count, but I’m just not sure why they’re part of the game. For handling supernatural effects, the game introduces the concept of magnitude, which is a measure of quality level for ghosts, demons and such which serves as a generic stand in for determining the potency of effects. There’s a delightful table that gives 0-6 magnitude examples of area, scale, duration, range, quality, and force. It’s a beautiful table, and it warms my old heart. See, this kind of table is also a Rosetta Stone for comparing values throughout the systems, whether that’s the intent or not. If I’ve got a gang with 5 people and you’ve got 20, how many steps of difference are there between them? It might be hard to intuit, but a quick glance at the chart indicates that those are scale 1 and 3 respectively. That matters a bit if the 5 are excellent but the 20 are merely adequate (quality of 1 and 3 respectively) and suddenly it’s a fair fight. Rituals (Yes, that felt like an abrupt transition, but I was just following the book) are pretty open ended and flexible, since they can do pretty much anything, but also come with an arbitrary amount of cost. To perform a ritual, a character must find it, then learn it (a long term project) then actually perform it during downtime. Performing a ritual has a stress cost that was established via questioning, and ticks a progress clock for something bad, and ends with a fortune roll for general badness. This is one of those systems that will work just fine if rituals enter into play with a specific intent, but it’s sufficiently open ended that it needs to be kept in hand. Thankfully, it has the built in escape clause that there is no guarantee that rituals behave consistently, so if something goes off the rails once, it need not repeat. Crafting is the general umbrella of building stuff during downtime (gadgets, tools, concoctions, whatever). As with rituals, there are some defining questions (in the invention step) which determine costs in the crafting step. There’s a roll, supplemented by money and resources, some potential qualifiers, and voila. As with rituals, this runs the risk of being too fuzzy, but unlike rituals, there are two pages of example creations plus a full crafting example, so the guidelines are probably a bit more practically helpful. Rituals and crafting are both fun little subsystems, but I admit I’m not sure if they’re load bearing. Both would clearly work in a game where they’re secondary elements, but I’d be a little worried to make them the core of a character. It’s not a definite problem, just something I’d want to watch. Hard not to love a chapter on hacking the game. There’s some solid advice on how to go about hacking, but note that it’s still within the general space carved out by the game. There’s guidance for making new crew abilities, even for adding mechanics, but if you want to hack Blades to run your Persona game, that’s a bit beyond the pale. I also have to applaud this as a way to introduce rules snippets and options without needing to frame them as such. Want a Vigilante crew, weapon styles or a trust mechanic? Well, what do you know, they’re in there as examples. Cunning and delightful. Ok, second break. We’ve made it through the rules! And just as before, I’m going to speed up, largely because I’m more focused on how setting material is used than the actual setting itself. Not that the setting isn’t delightful – it is – but that is more for reading and less for reviewing. Initial setting stuff is always initial setting stuff. Some history, high level details and so on. The timeline is welcome, if only because it’s full of plot hooks and elements. We get some shorthand on cultures, language, calendars, stuff like that. There’s a lovely little insert on Plasm, the handwavium that powers most of the tech. It has just enough detail to be able to hang adventures off, which is the right amount. I am delighted that there is a similar aside about food in Duskwall. Ghostlit cities surrounded by apocalyptic darkness are all well and good, but without basic infrastructure is all starts feeling like nonsense to me. As with plasm, it’s enough to be able to hang stuff off, and no more. Utterly welcome. We get a little but of a breakdown of the political power in the city, the shape of the Underworld, the role of Academia and the presence of Ghosts. This is foundational stuff, and it’s good – excellent even – but it’s never going to excite too much. It’s the groundwork that lets us move into the next section, where we get maps! And the maps are delightful. The city map is gorgeous, followed by two page spreads on each district. There are 12 in all, and each writeup includes landmarks, a general look and feel, notable NPCs, and a simple stat sheet and rules specifics for the district. The stats are Wealth, Security & Safety, Criminal Influence and Occult Influence, all with zero to five dots, and while I don’t think they have a direct mechanical effect, they are useful for comparing districts, and as a GM I would probably use them in some fortune rolls. From there we get a wonderful page of things overheard in Duskwall, and then…the tables begin. Rumors on the street, remarkable occurrences, lists of factions (Who all have great little half page writeups), vice purveyors, street scenes, building details, random passersby, supernatural threats, Scores, and so much more. The tables and reference materials are sheer nerdy delight, and pack a lot of city into very little space. FInish it up with a quick sketch of the world at large (one page of locations, one page map) then we’re on to credits and the (entirely passable) index. So, if it’s not obvious, I’m pretty enthusiastic about this game. We’ll be playing it locally soon, so I’ve been reading it with an eye on that, so enthusiastic is where I want to be. I’ve a few small gripes (the material that’s not actually in the book definitely irks me) but by and large, this looks like it’s going to hit my sweet spot, and I’m very much looking forward to playing! I should add, I still have not watched any actual play for this, though I intend to do so once I have posted this. I think it will address my concerns (most specifically, my fear that it might play like a downtime boardgame with score scenes) but I wanted to really look at the book on its own. I do no recommend this. Instead, when you settle in to read it yourself, make sure to have a printout of the sheet on hand, and see about maybe watching on of the great actual play sessions posted on line. This entry was posted in BladesInTheDark and tagged reviews on May 24, 2017 by Rob Donoghue. So, the next game is tonight, so I really need to get the last summary posted! Apologies to any comments I’ve missed recently – something managed to get past the spam filters, so I’ve been cleaning the stables by hand, and that meant a lot of stuff got stuck in limbo until that got sorted out. It had been a while since the last session, so I admit I had to check my old posts. Ok, so we came back from a long hiatus with our heroes headed south to Vendel. The roads and posts were fine until they reached the barricade, but things got sketchy after that. One night, Basillio noticed something odd about one of the posts they were going to stop at, and they stopped to send Zeta to investigate. It looked like it had been taken by bandits (Eisen mercenaries, by the look of them). Easily circumvented, but Zeta also heard the sound of prisoners, which demanded action. Action followed. They rode in through the gate and ambushed the ambushers – roughly a dozen brutes – and made short work of them with the help of their coachman’s grenades. The Doctor chose to enter the building herself and deal with the brutes inside, and the results were messy and deadly, mostly for them. Prisoners were rescued, including an Eisen nun (and member of the shawl) who hit The Captain in the face with a chair before realizing this was a rescue. A slow trip to Vendel followed, with the remaining Eisen following as prisoners. One of them, the leader, told his captors that Commander Heinrich of the Steel Hawks was his uncle and would willingly pay any ransom. These men were not Steel Hawks though, and Basillio surmised that they were some of the Eisen mercenaries who had come to Vendel expecting opportunity who were now making opportunity for themselves while politics remained at an impasse. No authorities along the way were willing to take them off the Heroes’ hands, but at the Vendel gates, the guard was more than happy to do so. The next step was to deliver the silver and their report to Red, who was surprised by a series of things, including the money making it, the presence of slaves in the mines, and the possibility that the Thane was not a radical atavist. She arranged for the Captain’s help to have the actual chests delivered rather dramatically to the floor of the guild (with the difference made up out of her pocket, in a quiet sort of gamble). When we say “To the floor of the guild” it’s quite literal – upending two chests down onto the floor. Chaos followed. The floor was shut down and a day of closed door meetings followed, once of which was watched very closely by The Swordsman. When the head of the Miner’s guild emerged, he was challenged to a duel (for his secret slaving), which was to follow the next morning. At dawn, a crowd had gathered – not so much to see The Swordsman as to see The Hammer, the highest priced duelist in Vendel who was fighting on behalf of the guildmaster. The Hammer was a serious looking woman who wielded two hammers (think sledgehammers) and who played the crowd masterfully while remaining very professional with her opponent. The duel that followed was fairly intense and closely matched. I talk more about it below in the mechanical part of things, but both parties were hurting when the Hammer knocked Basillio’s sword out of his hand and Basillio yielded. However, this was only the second most exciting thing to happen as a scream came from within the guildmaster’s pavilion – someone had taken advantage of the distraction of the fight to assassinate him. Oh, and yes, The Acrobat was in the pavilion when this happened. So chaos has increased, and our heroes manage to slip away in the chaos, partly because guard response was surprisingly non-present. A lucky break, until word reaches them that the Steel Hawks have surrounded the Guard HQ (and jail) and matters are about to get violent. Ok, so the city is totally going to hell. Fighting in the streets, whole nine yards. Nearest force of men able to deal with this is the new High King, but the way there is problematic. But if a ship can get out of harbor before it’s locked down, then head inland form one of the coastal cities, he might be reached in time. But who could do such a thing? Getting out of the harbor was tight, but ended up being a dramatic use of the Doctor’s Time rune – she borrowed some future time (so the bad guys had a round to close in), but the shop then got double action for its escape. Super fun. Probably an utter misuse of the power, but I am 100% ok with that! I tried something new with the coachman in the fight, something I’m calling NPC triggers. The idea is that if you have NPCs in the fight, you can spend a raise to have them act, and that action will generally reap some manner of reward. In this case, when the coachman threw a grenade, the player got to roll some dice (6, which was too many in retrospect) and every hit on that roll took out a brute. Effectively it increased the effectiveness of the single raise in return for constraining what it could be used for. It was a good start, and it’s lead to me writing up a small system for handling named brutes which I’ll probably release to the Explorer’s Society when I have a minute. The duel was interesting – this was the first time we’d really had a chance to throw two 5 dot duelists at each other, and I was very curious how it was going to go. The end result was mixed. First off, the players had fun as audience. I was really worried about that, because this was really a focus on one character, but I suspect the novelty kept it engaging. Also, Sorte and Glamour sorcery ended up handing The Swordsman a giant bonus in the fight, which had an interesting effect., and also helped with investment. The actual die rolling was a pair of huge piles. I spent a stack of Villain Points to bring The Hammer’s 10 die pool up to a 16 to be able to challenge Basillio. It revealed that counting 15s is definitely a bit more cumbersome than 10s. I like the mechanical effect, but it slows things down in play, so I need to bear that in mind. Basillio started with a small advantage (something like 11 vs the Hammer’s 10) and things proceeded pretty well from there. The actual back-and-forth, move-countermove was great. Very fun, very dynamic, kept things going. I screwed the pooch in terms of player expectations. When the Hammer disarmed Basillio, my thinking was that it would cost him a little tempo (since he could just spend a raise to recover the blade) but the player felt strongly that he was skating on thin ice, and that losing tempo would turn things against him very strongly, so he conceded. I was surprised, because thought the impact wouldn’t be that pronounced, but I also knew that The Hammer’s die pool was depending on my villain point spend to stay competitive, a fact the player did not have. Running the numbers later, I think we were both right. In subsequent rounds, Basillio’ die advantage would have made a substantial difference BUT the way NPC wounds are handled would have meant that it would take so long to drop her that he could have gotten nickel and dimed to death in the interim. So, all in all, I’m kind of filing this away as one more reason I need to retune the way NPCs are handled. The villain rules are well tuned for one villain vs a group of heroes, but that is not always going to be the arrangement. This entry was posted in Uncategorized on May 6, 2017 by Rob Donoghue.